1. 4-3-2-2-2 (= original line-up). Period of creation 2008-09-16 to 2008-10-30 (1st version); 2009-07-09 to 08-08 (2nd version); 2010-06-23 to 29 and 2014-08-08 (3rd version). Title 1st version Danse Canonique 2 (Canonical Dance 2) for 15 prepared strings. Duration 12 min (1st version: 7 min). Commission / occasion 1st version: Commissioned by the institution Musik i Syd (Swe) for the string orchestra Musica Vitae (Swe). 2nd version: Commissioned by the festival Venice Biennale 2009 (Ita) for the Orchestra J Futura (Ita). 3rd version: For the festival Young Nordic Music 2010 (Fin) and for the Avanti! Chamber Orchestra (Fin). The main idea behind the piece is a confrontation and fusion of two timbral pro­ces­ses. The lower string instruments, from 2nd violin to double bass, undergo a timbral de­vel­op­ment in 3 equally long parts from a dry and per­cus­sive preparation sound to a sus­tained and dis­tort­­­ed bowed sound. This is achieved by 3 dif­fer­ent playing techn­iques: Plucking the prep­a­ra­tion objects or the strings with the fingertip, strik­ing the strings with the fingertip, with the palm of the hand or with the hair or wood of an ordi­nary bow, as well as bow­ing the strings with a plastic comb or with the hair of the bow. The 1st and 2nd part appear as a rhythmical, moderately tensed dance of plucking resp. strik­ing attacks which trigger rattling sounds of the preparation objects. The 3rd part reduces the rhythmical energies and creates a gradual crescendo from a mys­te­ri­ous anticlimax at the beginning up to an ec­static culmination in the end. 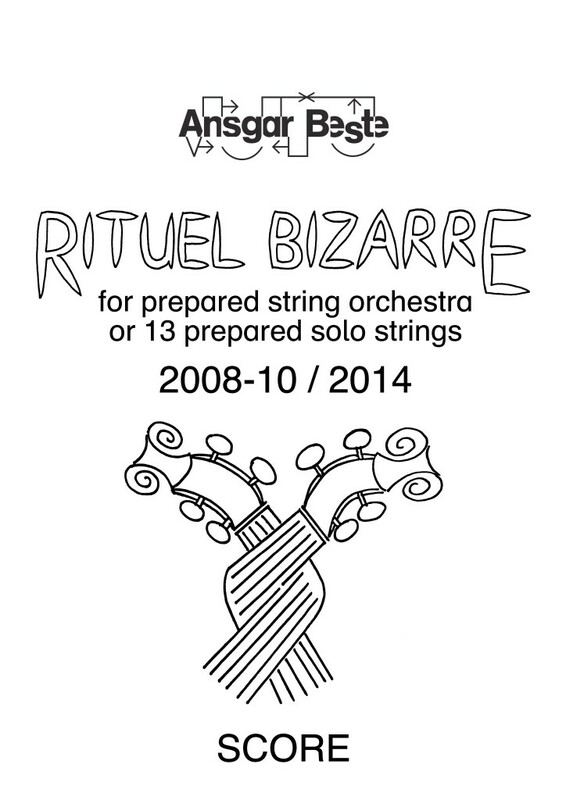 Apart from singular initial plucking attacks, the 1stviolins increasingly and mainly bow on the strings with the hair of an ordi­nary bow producing sounds distorted by the pre­pa­ration objects. The timbral de­vel­op­ment (in one part) ranges from slow, pedal point-like glissandi via fast, lively glissandi and twittering staccato notes to agitated tremolo motion. These two groups of the string orchestra act as dialectic antagonists who gradually converge in the last third of the piece and finally fuse within the concluding tremolo. On the whole, the unusual and unexpected sound of the string orchestra along with a re­pet­i­tive, canonical and dance-like rhythmical struc­ture result in a bizarre and rit­u­al­istic musical character. 1,21% 1st prize at the 55th Com­position Prize of the State Capital Stuttgart (Ger), 2/165 (2010-05). 3,33% Selection (Swe) for the ISCM World Music Days 2015, 2/60 and nomination for the ISCM Young Composer Award (2015-03). 9,52% 2nd prize at Uppsala Composition Competition 2012 (Swe), 2/21 (2012-02). 9,62% Selection (Swe) for the Nordic Music Days 2016, 50/520 (2016-05). 15,91% Selection for the festival UNM (Young Nordic Music) 2010, 7/44 (2010-01). 17,14% Shortlisted (Swe) for the ISCM World Music Days 2012, 12/70 (2011-06). 20% Shortlisted (Swe) for the ISCM World Music Days 2015, 12/60 (2014-10). 53,33% Selection for the Presentation day of new orchestra music with the string orchestra Musica Vitae in Växjö (Swe), 8/15 (2017-04). 66,67% Performance funding from the project Ny(a)modigheter, initiated by MAIS (Collaboration of Music Organisers) (Swe), 34/51 (2018-01). duration: 2 min 37 sec. duration: 10 min 15 sec. duration: 2 min 55 sec. duration: 4 min 21 sec.